Wedding season 2016 has certainly kicked off with a bang for Konstantin Photography! We have participated in some of the most popular bridal shows in the area, and we’ve also been in a few exciting publications. Most of all, we’ve been privileged to work with couples in creating timeless engagement and wedding photographs. On Saturday January 17, 2016, Konstantin Photography boarded the ferry and traveled over to Vancouver Island to participate in what would be our last bridal show for now. Don’t worry – we’ll have more exciting news for you to read about soon! As the wedding season heats up, we’ll certainly have some incredible photographs to share with you! Over on Vancouver Island, we took part in the Victoria Bridal Show’s January event. We’ve been to quite a few of the Victoria Bridal Show events, and all of these events offer a top-notch selection of the area’s best wedding vendors. Brides-to-be get to peruse the year’s latest fashions while taking in a day of fun and relaxation, all while taking important steps in planning the biggest day of their lives. We were among a roster of incredible wedding vendors that includes professionals from every facet of the wedding industry, and we were pleased to talk to brides-to-be all day long about their various options in engagement and wedding photography options. The Victoria Bridal Exhibition offered a day full of exciting events, including door prizes drawn every hour and a grand prize drawing at the very end. Doors opened at 11:15am with a Wedding Ring Magazine new issue reveal followed by a Eryn Sharpe Trio presentation at 11:30am. At 12pm, brides-to-be were treated to a fashion show presented by The Bride’s Closet & Moores Clothing For Men. After the first fashion show, there was a very good presentation that gave brides-to-be how to look good in their wedding photos (although we try to offer some advice on that! ), which was followed by another Eryn Sharpe Trio presentation. In the afternoon, attendees got to see another fashion show presented by Victoria Bridal Boutique and Moores Clothing For Men followed by a presentation by Rob Jennings about picture perfect flowers. The day offered a ton of information for brides to take in. If a bride-to-be was just getting started in her wedding planning, then she surely walked out with a wealth of fresh ideas! The Victoria Bridal Exhibition is never a disappointment – after all, it’s the second largest bridal trade show on the island. Not only do brides-to-be get an opportunity to get a firsthand perspective of the latest bridal styles, fashions, and designers, but they get to meet and mingle with the leading wedding vendors in the area. 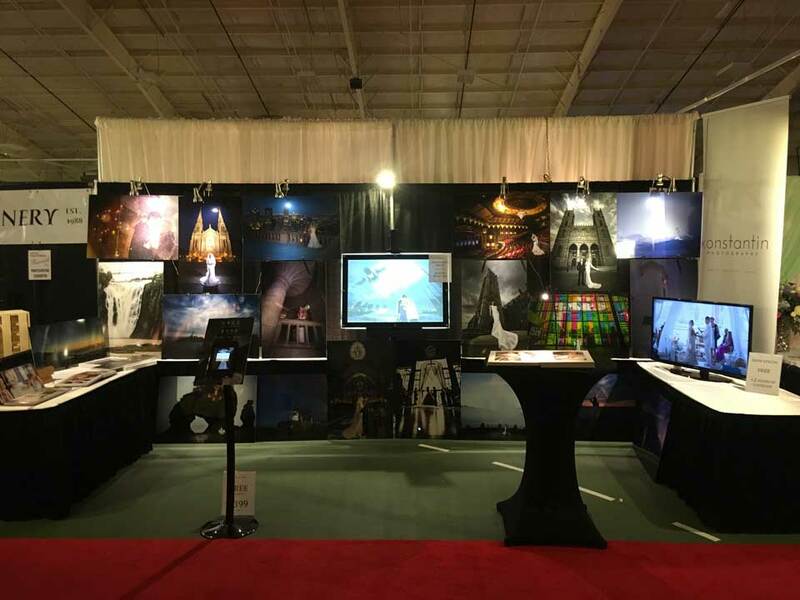 The last few months of bridal shows has been extremely busy, but it has been such a pleasure to travel and meet with brides from all over the area. If you are a bride-to-be who’s planning a wedding, we recommend trying a bridal show if you haven’t already! If we’ve met you at a past bridal show, we welcome you to reach out to us if you’re interested in our services. We warmly welcome any questions you have about our services! Planning a wedding can get overwhelming, but wedding vendors such as Konstantin Photography ensure that you’re never alone when creating the wedding of your dreams. Filed under Konstantin Photography News. Tagged vancouver island, victoria, wedding show.